When one focuses on visual representations of display and color, notions of reading these representations are simultaneously attended by attempts at their decryption. As an audience who encounters things that are fundamentally meant to be looked at, the specific relationship that we have with objects and our ability to decipher them comes into sharp focus. 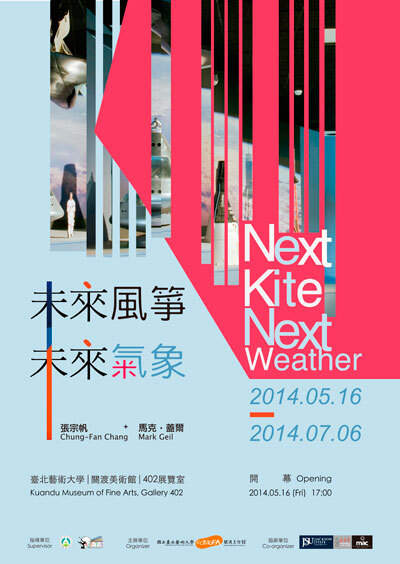 Next Kite, Next Weather encompasses drawing installation, painting and photography by Mark Geil and Chung-Fan Chang. In the exhibition, the messages extracted from displays encourage the viewer to interrogate what is real and who is the authority. The destiny and the purpose of these photographs, paintings and drawings are to be contemplated in so far as the information they convey and the broader implications they begin to reveal. Mark Geil’s work highlights visually and fundamentally how knowledge is conveyed through systems of museum display, using both historical precedent and contemporary practice. Through his photography, Geil seeks to visualize knowledge while Chang identifies the visual metaphor of color and its significance in society. Both bodies of work exhibit a unique internal logic. For Chang, this internal logic is the byproduct of the states of mindfulness of meditation that inhabit her artistic process. In Geil’s work, the stillness of the photograph and the stillness of the museum display become a “stillness doubled.” This synergy works to highlight both the knowledge these museum displays were meant to convey and the overarching machinery and politics of display. On the other hand, the fluorescent colors in Chang’s Kite series command the viewer’s attention and compel the audience to observe closely the saturated, luminous geometric shapes. The color is obsessive, disturbing yet demonstrates the authority to demand and attack the viewing experience. Chang’s neon color makes its demand yet the contrasting subdued hues of her landscapes yield another viewing experience. These other colors evoke one’s experience of looking at the same forest at different times of the day. These paintings fuse with the wall installation drawing in which the viewer is invited to an uncanny internal weather that runs through the constellation of marks. To the viewer, there is a particular direction and concentration in her mark making that somehow replicates the force of wind. These drawings have a sense of a band of wild horses running through them, kicking up a swirl of earth as they gallop across the wall. That weather is again organized and synchronized in Geil’s photography, in which the objects of collection and the tropes of display manifest phenomenal and complex information for the viewer to interpret. These collections and the mechanics of their display are the subject of an intense local curiosity. These museums are often specific to their region, much like the local weather is specific to a region. Geil’s photography depicts collections, dioramas, models and even buildings as displays which deliver a sometimes uncomfortable and visually challenging navigational experience for the viewer. Likewise, the neon color fields in Chang’s abstract landscapes serve as intruders to the surrounding. Intruders that crossexamine how fluorescent and artificial colors affect our vision and how that effect can be a signifier of conflict in society. As Geil identifies visual mysteries, Chang creates puzzles for the viewer through painting and drawing, which disclose the underling harmonies of this exhibition. This orchestration of tacit violence is organized the same way the wind is organized with its gusts, swirls or downdrafts. Chang’s drawing installation appears to be disordered when viewed closely but becomes beautifully organized when viewed at a distance. Her drawing and painting assemble historical concerns, social signifiers and meditative practice all into a singular voice. Geil’s photographs investigate the institutional organization of knowledge, the locality of American History and the anatomy of display. Ultimately Mark Geil and Chung-Fan Chang both propose questions and offer hope for the viewers to contemplate the weather of color, the wind in the drawings, the clouds in the drawings, the rain in the drawings, and the singular curiosity of photography.